I shot this pic down the laneway from the bunny that was painted on a garage door that I showed a couple of weeks ago. The lane is known as Croft St and is mostly lined with garages but there are a several homes as well. 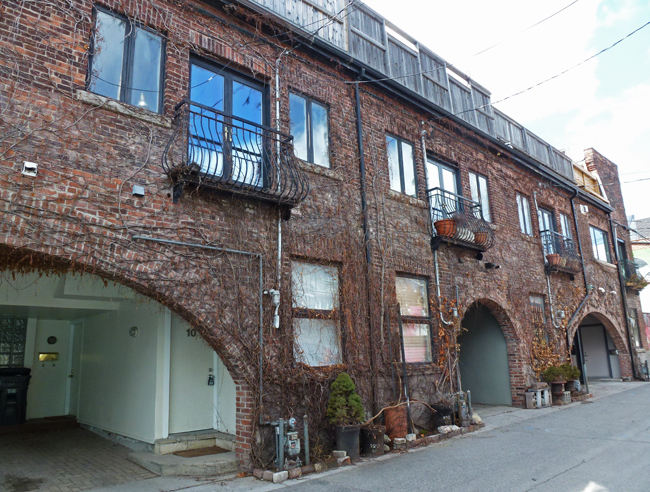 This building was originally a munitions factory in WWI and then was a rug cleaning building before being converted into five townhouses each of which is about 2,000 sq ft and will set you back around $2million. They look totally different in summer when covered in ivy (see HERE). More places that I would love to see inside! Two million bucks? That's crazy! Unless everything inside is plated with pure gold! Yikes! Real estate agents are making a killing on commissions. That's a lot of money... the inside must be very precious. I think you should buy two units and make yourself a 4000 sq ft apartment. I love how you show us the living city with it's back stories too! How different the look when they are covered with ivy. 2 million is a bit out of my price range. Well, actually it's quite a LOT out of my price range. They must be sumptuous inside. Wow, expensive place. Do they charge extra for the ivy? I love the way it looks with the ivy, very cool indeed. I like the use and look of this building but perhaps the cost is a bit overrated. $2 million.. yikes! But they do look fabulous, lovely covered in ivy Pat. Yes, this is one I'd like to see inside too. I really enjoy the many lives and stories that are connected to so many buildings or houses too!